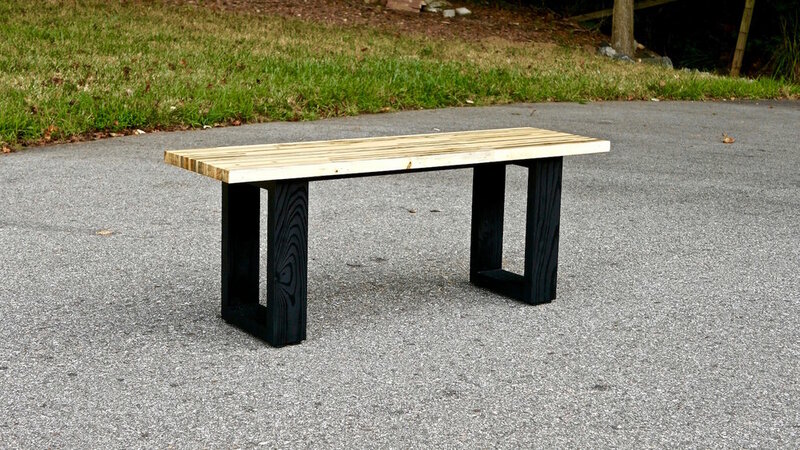 In this video, I show you how to turn a pile of reclaimed pallet wood into this beautiful, modern, outdoor pallet wood bench. I wouldn't call this build simple, it is extremely time consuming to use pallet wood, but the trade-off is that the wood is free. You could use this same top design for a pallet wood coffee table, bar top, headboard, etc. Just change the size and you'll be golden. I think this is probably the last piece of pallet wood furniture I will build, and I have a special project for my remaining pallet wood at the end of the video! Pry the slats off with some kind of tool. There are a lot of choices in this area, I’ll put a link to the tool I’m using in the build article. Cut the centers of the slats with a circular saw. Cut the slats from the supports with a reciprocating saw. All three options have their pros and cons, but I used options 1 and 2 for this build. Once you’ve got the pallets disassembled, you need to remove any metal from the wood. This could include nails, staples, screws, etc. You want to make sure and remove everything metal, especially if you’re planning on milling your pallet wood with a planer, jointer, and table saw. Any leftover nails will knick the blades on these tools and replacing them is expensive. Once all of the metal is removed from your slats, it’s time to mill the wood. I used a jointer, planer and table saw for this process. First, flatten one face on the jointer. Next, using the face you just flattened as the reference face, facing down on your planer, bring your pieces down to their final thickness. After thicknessing, square up one edge of the slats at the jointer and then cut your slats to their final width at the table saw. I cut my slats into 1 ½” strips, as this left me with a relatively small amount of waste. This width will depend on the size of the slats you’re using. Finally, at the miter saw, square up each end of your strips, removing any cracks or jagged edges. After your strips are all milled, you can start to layout your design. The final dimensions I wanted for my bench top were roughly 43” x 13”, so I laid out the strips with at least a few inches on each side to leave room for final cleanup after gluing. For the glue up, I cut a piece of scrap MDF to the size of my final pallet wood bench top and used it as my reference flat surface. I applied glue to each strip and brad nailed them to the piece behind it. I could have potentially tried to just apply glue and clamps, but I had over 75 totals strips in this bench top and the chances of the pieces slipping around was extremely likely. Using brad nails kept this to a minimum. Just keep gluing and nailing the strips on until you reach your final width, then apply clamping pressure. After the glue dries, trim the ends to their rough length at the miter saw, then flatten one side of the bench top at the planer. To accomplish this, I attached the pallet wood bench top to the same piece of MDF from the glue up, using countersunk screws from below. This gave me a flat reference surface for the planer, and served as a planer sled. This bench top was too wide to pass over my jointer, otherwise I would have used it for this step. Once one side is flattened, square up one of the edges at the jointer, and then flatten the other side at the planer. Finally, square up the other long edge at the table saw, and the bench top as at its final dimension. Next, sand the bench top, working your way through the grits, starting at 80 grit, moving to 120 grit, then finishing with 180 grit. After sanding you can chamfer the edges with a block plane and give them a light sanding. For the finish on this bench top, I used spar urethane. This bench is for my mom, and it will be used on a porch outside. Spar urethane has additives that help protect the wood from UV damage and is also slightly flexible to account for seasonal wood expansion and contraction. I applied three total coats using a foam brush, and lightly sanded with 320 grit sandpaper between coats. The final finish is a smooth, satin finish, exactly what I was after. For the legs, mill up some more pallet wood, this time using the 2x4 supports. You’ll need four pieces per leg: 2 pieces at 15” long and 2 pieces at 7 ½” long. To assemble the legs, I decided to use pocket screws. With a material thickness of 1 ½”, I used 2 1/2” pocket screws, rated for exterior use. I assembled each leg with glue and screws. I also added a center support piece. This was to help reduce any sagging in the bench top and also helped to provide some lateral stability. The length of this piece will depend on the length of your bench, but in my case, it was roughly 26” long. I attached this center support piece to the legs using pocket screws as well. Once the base was assembled, I painted it black using an outdoor rated spray paint, and then let both the base and top cure for a few days. Once both finishes are sufficiently cured, attach the base to the top from below using 2” exterior screws, pre-drilling and countersinking the holes before attaching. Finally, add four small rubber feet to each leg, to keep the legs off the ground to help prevent any water damage. After attaching the feet, the pallet wood bench is done.